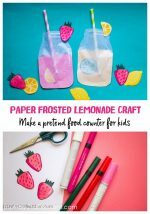 Add to your pretend play food collection with our Paper Sandwich Craft for Kids – a bright and colorful paper version of the universal kiddie favorite! 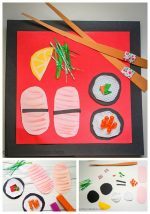 In our last post, we put the spotlight on a traditional delicacy from a special culture, with our Paper Sushi craft. Today, we’re going in a different direction – we’re going to make something that’s popular in homes across the globe, especially with kids. Yes, we’re making a sandwich! A sandwich is the first choice for a quick meal – just slap two slices of bread together with any filling of your choice. It could be simply butter – or it could be a plethora of meat, vegetables and sauces! However, we’re going the healthy way today, which is why our sandwich uses whole grain bread and lots of veggies. Tuck in! 1. Let’s first gather our ingredients for the sandwich! 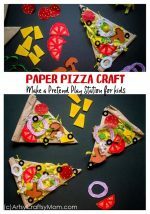 Cut out squares and triangles from yellow paper and punch small holes in it to make it look like cheese. 2. 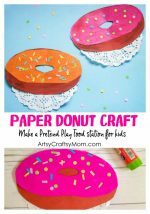 Cut out circles from green, blue and red craft paper. The green circles are our pickles, or cucumbers. Use markers and chalk to draw a peel and seeds in the center. 3. The blue circles are our turnip slices, so use blue and purple markers to create the circular grooves inside. 4. Turn the red circles into tomato slices, complete with seeds and segments. Make it look juicy! 5. From the pink paper, cut out a strip and a few rough ovals to make radish slices. Use pink colors to give it some appropriate shading. Also cut out strips of green from craft and tissue paper. 6. What’s a sandwich without bread? We’re cutting our carbs, so all we need is a single slice of bread, cut into two triangles. Leave the crust by coloring the borders brown. We’re going to use each triangle for a separate sandwich. 7. For the first sandwich, put together the green craft paper strip, the long radish strip and a slice each of cucumber, tomato and cheese. Stick everything in place, making sure all the edges are under the bread slice. 8. For the second sandwich, bring together the radish and turnip slices, along with the remaining cheese and cucumber. Things are starting to look yummy! 9. Time for finishing touches! Give the sandwiches a grilled effect by drawing brown lines on the bread. Make a simple omelette with white paper and a small circle of yellow foam. Cut up some green tissue paper for greens and arrange everything on a platter. Don’t forget some red paper for ketchup! This is probably the first project where a sandwich brown paper bag was actually used to make a sandwich! 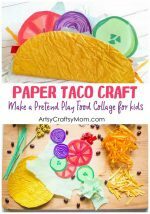 This fun paper sandwich craft can be used to teach young kids table manners or older kids about table settings. 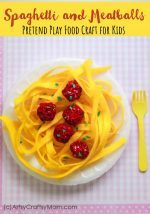 It’s also a great way to talk about healthy foods, different kinds of vegetables or food groups. Go on and customize it, using other colors and materials to make your favorite sandwich. Be careful – it might look tempting enough to eat!